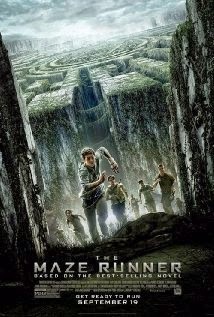 The Maze Runner is an action/mystery/sci-fi/thriller all rolled into one. The movie is based on a series by author James Dashner. It involves a boy named Thomas (Dylan O'Brian) who is ascending in an elevator with no memory of getting there or who he is. As soon as he reaches the top, he sees a bunch of other boys staring down at him. One of them welcomes him in and explains the situation and that in time he will remember only his name. What would anyone do in a situation like that? I would freak out. But Thomas adjusts in just a few days and starts to take it all in. The community of boys have set up a system in the maze where everyone does their part to live in harmony. They are located in the middle of the maze where they can plant, live under trees and are surrounded by agriculture to survive. No one knows why they were put there, but once a month another boy and supplies to either live appear. Each boy is the same and the only memory they can remember is their name and nothing more. Thomas is curious and asks what exactly is out in the maze, but only special groups called "runners" know. He befriends their leader, Alby (Ami Ameen), Minho, another "runner" (Ki Hong Lee), Chuck (Blake Cooper), Newt (Thomas Brodie-Sangster), and somehow makes an enemy with Gally (Will Poulter). Things begin to change when, a few days after Thomas's arrival, the elevator rises again. This is weird because that never happen outside of its monthly schedule. In the elevator is a girl. To everyone's surprise, she's the first and only girl to ever come through. Before she passes out, she calls out Thomas's name and in her hand is a note saying "she's the last one ever." Her name is later revealed to be Teresa (Kaya Scodelario). After taking a few trips into the maze before her arrival, Thomas is now determined to find a way out and save everyone from the Grievers, a deadly creature in the maze. There is more than just the Maze and Thomas and Teresa have a hand in all of it. This movie is full of surprises and fun adventure in a thriller/action sort of way. If it does good, which I know you'll want it to, it could have some great sequels as well.